Summary: Sam Elling works for an internet dating company, but he still can't get a date. So he creates an algorithm that will match you with your soul mate. Sam meets the love of his life, a coworker named Meredith, but he also gets fired when the company starts losing all their customers to Mr. and Ms. Right. Last year, I reviewed a very original novel called THE ATLAS OF LOVE by Laurie Frankel. I definitely had mixed emotions about the story, but one thing I acknowledged was that Ms. Frankel is a very talented writer. So when I was given the opportunity to read her latest book GOODBYE FOR NOW, I didn't even hesitate. Not only was I curious to see what the author had to offer this time around, but GOODBYE FOR NOW is generating a lot of buzz -- foreign rights have already been sold in 25 countries, film rights have been sold to Summit Entertainment, and Library Journal gave it a starred review. At its heart, GOODBYE FOR NOW is a bittersweet love story between of Sam and Meredith, two co-workers who fall in love after they are identified as soul mates by an algorithm that Sam created to match couples for the internet dating company that they both work for. Sam is soon fired because his algorithm is "too successful" and the company is losing business, and he finds various ways to fill his time before he is able to land another job. In the meantime, Meredith and Sam's relationship continues to grow -- they truly do seem to be soul mates. And then Meredith begins to wonder if they can use Sam's technology to help others work through their grief. They create a company called RePose (pretty clever! ), and they are surprised by the demand for their service. As they become more and more invested into their new company and their clients, they quickly discover that dealing with the grieving friends and families is anything but simple. I would love to tell you what happens next, but it's a pretty big surprise and one that is best left discovered as you read the novel. Suffice it to say, that what occurs is shocking... and gut-wrenching, and might even cause you to shed a tear or two. Remember, this is a bittersweet love story that examines all sorts of love.. and loss! Once again, I have to give credit to Ms. Frankel for writing a very unique novel. In GOODBYE FOR NOW, she's managed to create an extremely interesting premise (communicating with our dead relatives) that's funny and entertaining... and touching. However, she has also touched upon some major themes that are universal to all of us including love, loss, and grief. Moreover, she had brought to light some very important moral and ethical issues that I consider rather thought-provoking. To say that Ms. Frankel has accomplished a lot with this novel is an understatement. I'm not exactly sure that I loved GOODBYE FOR NOW, but I did appreciate it a great deal. (In fact, I felt almost the exact same way after reading THE ATLAS OF LOVE.) I've seen some comparisons being made to the novel ONE DAY, but I'm not sure I totally agree. I thought the writing in GOODBYE FOR NOW was much smarter. I also have to say that ONE DAY affected me much more emotionally (I cried like a nut! ), and GOODBYE FOR NOW was much more thought-provoking! One thing that I most definitely enjoyed about GOODBYE FOR NOW was how witty the characters were -- this book had some very funny moments. I also appreciated how multi-layered the characters were and how complex their relationships were. Having said that, I don't think I felt a strong affinity with either Sam or Meredith (I actually thought they both were rather strange), and I certainly wasn't as caught up in their love story as I had hoped. 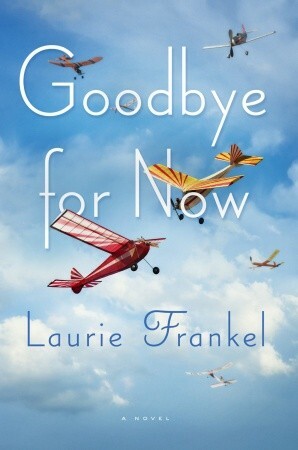 It's probably obvious that GOODBYE FOR NOW would make a great pick for your next book club meeting. I wasn't able to find discussion questions yet, but it appears that they are coming soon. Because GOODBYE FOR NOW is such an original story, most readers will find it very entertaining. However, I was impressed by how much substance this novel had. There is so much to delve into including Sam and Meredith's relationship, Meredith's relationship with her grandmother (both the real one and the virtual one), as well as Meredith and Sam's relationships with their families. In addition, there are other universal themes to explore including love, loss, grief, forgiveness, and redemption, as well as some moral and ethical issues. Overall, I enjoyed reading GOODBYE FOR NOW. I was impressed by Ms. Frankel's writing style as well as her original storyline, and I liked how this book tugged at my heartstrings; however, I think what I appreciated the most was how much this book made me think. It does sound interesting and a little creepy. I've heard there's a dog named Milou in the book, so the author must be brilliant. It is an interesting premise and yes, creepy in a way. I will keep your review in mind if I decide to read it. Your review has definitely piqued my attention. I have added this book to my list to read! Because of your review, I read this book, and I loved it. I am a widow, and belong to an online widow/ers support group, so perhaps I'm more prepared to think about the topic than others who posted about how 'creepy' the premise is. But let me tell you, when you have actually lost the person who helps you breathe each day, there are moments when nothing sounds too weird to consider, just to have one last word from them. Thank you for your review and making me aware of this book. I've brought it to widownet.org's bookclub for discussion.